If you're tasked with installing the Acrolinx Content Analyzer yourself, ask your Acrolinx administrator for the installer file if you don't have it already. If you're running the Content Analyzer on a Windows operating system, just double-click the installer and follow the on-screen instructions. Important: To use the Content Analyzer on Microsoft Windows, you need to install Microsoft Visual C++. We've included it in the Content Analyzer installer. When you run the Content Analyzer installation wizard, you might see a Microsoft Visual C++ window. Agree to the terms and click Install. If you're running the Content Analyzer on Mac OS X, open the Acrolinx setup file. 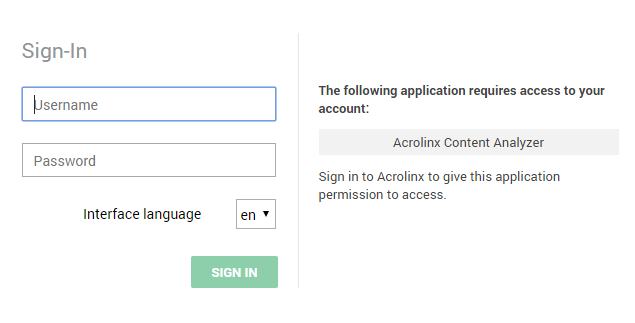 Before you can check documents, you'll need to connect to an Acrolinx server and sign in. Enter the Acrolinx URL in the Server address field. Click SIGN IN to open the Acrolinx sign-in page in a browser. Click CONFIRM to allow the Content Analyzer to access your Acrolinx account. You'll see a confirmation that you're successfully signed in. Click Save in the Preferences window. If you need to change your Acrolinx URL, you can always go back to File > Preferences to sign in again. Click to go to the main window and select your settings and content. Or open a settings file directly. From the settings window, you can select all your settings. Click LOAD CONTENT to import your content. Note that Acrolinx doesn't work consistently when checking PDFs. We recommend using the source document to check your content. If you have super administrator privileges, you can edit the file directly in the dashboard navigate to Maintenance > Configuration Properties . 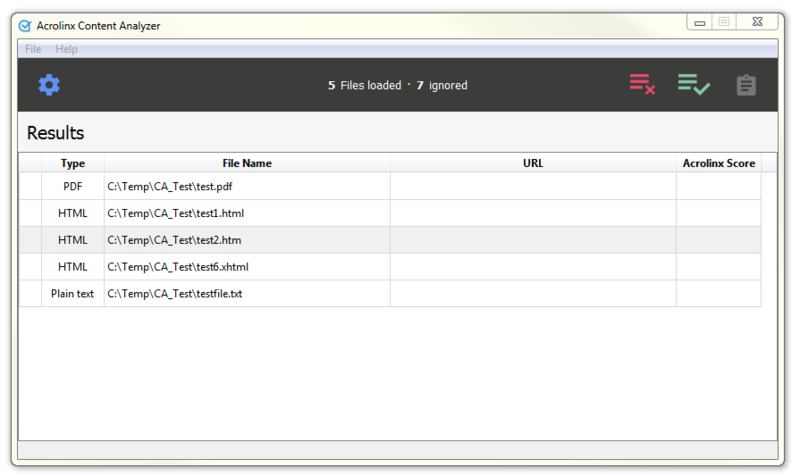 For more information, see the article How to Configure Acrolinx to Recognize Your File Types . Click Select Files or Folders if it's not already selected. Click on the three dots , browse to the folder that contains the files and click Select Folder or enter the path to the folder. If you haven't already, define your check options. Optional: Untick Include subfolders if you don't include all directories within that folder. If the directory contains files that you don't want to check, first select the unwanted files. The Content Analyzer finds all files of type: TXT, XML, PDF, HTML, and Microsoft Office. Press Delete or click and you'll remove the selected files from the list but keep them on your hard drive. Tip: If the directory contains mostly unwanted files, press CTRL+A to select all files in the list, deselect the files that you want to keep, then press Delete. You deselect files by clicking the file names while pressing CTRL. As well as locally stored files, the Content Analyzer can check web pages across one or more websites. To find web pages, the Content Analyzer follows all the links from the given URLs, and continues following links on web pages that are found from the given URLs. The Content Analyzer only searches for HTML pages. Click the Select Websites if it's not already selected. Click on the three dots . You'll see a window open where you can enter a URL or list of URLs. Press Enter after each URL. Tip: If you want to search an entire website, then don't prefix your URLs with "www" . Not all web pages on a website have the prefix "www" so to be safe, leave it out. This setting defines approximately how many pages the Content Analyzer imports before stopping the search. The link depth is the distance in links between each URL and a web page. For example, if you enter 0 , the Content Analyzer finds the page that you entered as the start address only. If you enter 2, the Content Analyzer follows the links on the starting page and continues following the links on the pages that were found through the starting page. With Maximum link depth set to -1, the Content Analyzer follows all links that it comes across. Important: If a URL redirects to another URL, the redirection is considered as one level in the link depth. For example, if your starting URL redirects to another URL and you have a depth of 1 configured, the Content Analyzer interprets the redirection as one level and stops following any further links. You can explicitly define which pages you want to include in the search of the websites you selected. Enter the keywords without a space before or after. Use the pipe symbol, | , to separate the keywords. Note that “Allow Pages” works best if the website allows crawling on all directories. Sometimes websites don’t allow crawling on subdomains, so the Content Analyzer can't load the pages. You can explicitly define which pages you don’t want to include in the search of the websites you selected. Important: Pages that are denied take precedence over pages that are allowed. By default, Acrolinx doesn’t include the content from the headers, footers, and iframes of your web content. Select the option Include headers and footers to add headers, footers, and iframes to the check. For more detailed information on how the Content Analyzer crawls the web content, see the article Using the Content Analyzer to Check Your Web Content . Before you start checking, make sure that you have the right check options. Language Select the language of the documents that you want to check. This will also define which Writing Guides you can select. Writing guide Select the set of style and grammar guidelines that you want to use. Reuse sentence bank Select the sentence bank to store the sentences that are collected during the check. You only need to do this if you've added sentence banks in your Acrolinx server. This option is only visible to users who have the Acrolinx reuse module installed. Issue Types Select the categories that you want to check for. For example, many people start off by selecting Spelling , Grammar , Style , and Deprecated Terms . You might use one of the other categories if you have a special use case. Select Reuse to check for the correct use of standard sentences that have been identified across a set of documents. Select Valid terms to identify terms that have been validated as preferred or admitted in the terminology database. Select Admitted terms to check for terms that are OK in certain contexts but have specific guidance on when they're appropriate (your Acrolinx server administrator must turn on this option). 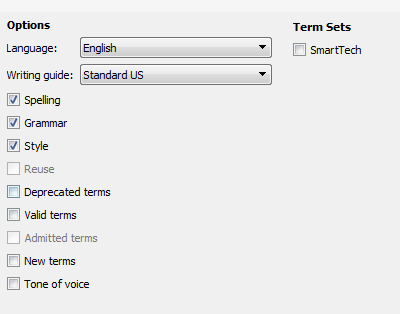 Select New terms to identify words or phrases as potential terms to add to the terminology database. 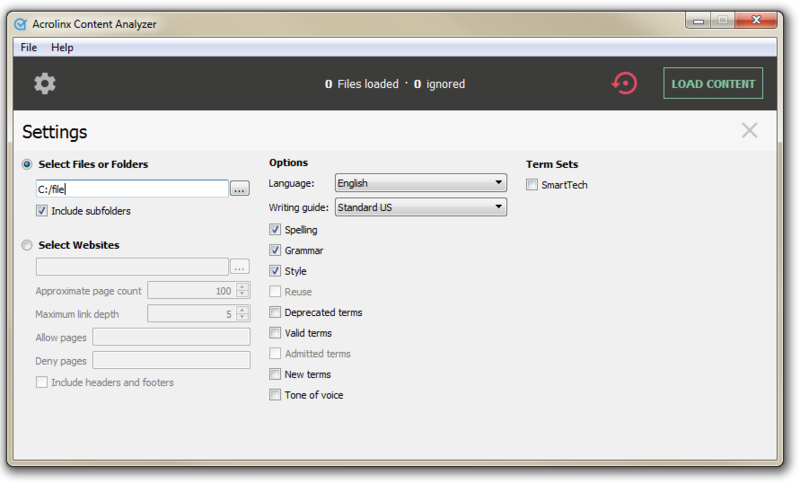 Select tone of voice to check the tone of voice in your selected files or web pages. After selecting your files, you're ready to start a check. You'll see the status window, that tells you which document the Content Analyzer is processing and at which stage it’s at. Depending on how many files you've selected, the check might take a while. Take a break and we'll let you know when the check is done. After you've checked, you can scan the Acrolinx Score in the results list to get a quick overview of an entire project. To show the document status, the text color of the Score appears in green, yellow, or red. Click on the Score to open the Scorecard. When the check is finished, you're ready to open the Content Analysis dashboard. In the Content Analysis dashboard, you can see the overall quality of the content that you've checked. It provides different charts and breakdowns of the statistics, to equip you with a powerful analysis tool. Click to view the Content Analysis dashboard. The dashboard opens in your default browser. To learn more about Content Analysis dashboard and its features see Content Analysis Dashboard . You can always go back and change your preferences. In the File menu, select Preferences . In the General tab, you can change your server address, your sign-in details, and your interface language. Most content doesn't just contain text, it also contains images, diagrams, and sometimes markup like XML or HTML. To check text correctly, Acrolinx needs to extract the text from your content. The Content Analyzer supports server-side content extraction processing. You can define the extraction settings by adding and uploading Content Profiles to your server installation. You can configure your Content Profiles using the instructions in the section Content Profiles . However, your guidance package also comes with default Content Profiles. To find out more on how you can get Acrolinx to read your text correctly see the article Getting Acrolinx to Read Your Text Correctly.